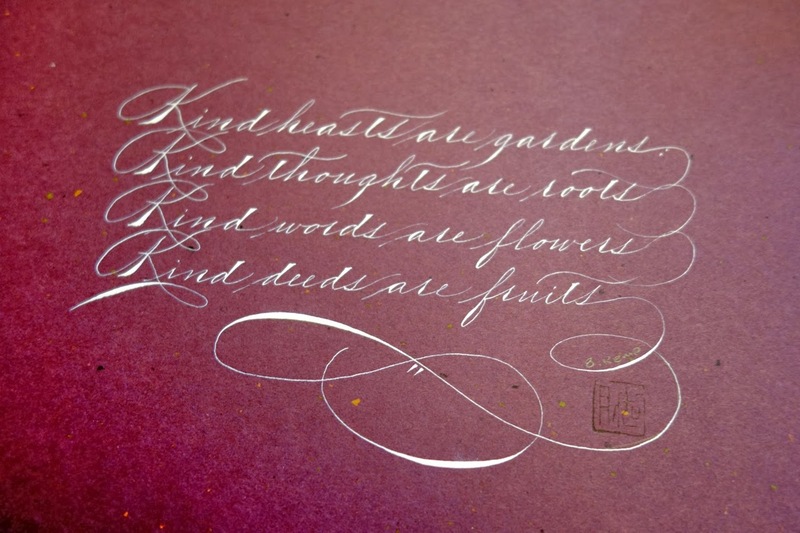 Bill Kemp is a master calligrapher who lives in Albuquerque, New Mexico. Castle in the Air flies him to Berkeley several times a year to teach classes in various types of calligraphy and lettering. Bill’s knowledge, skill, and patience have made him a favorite among new and returning students. 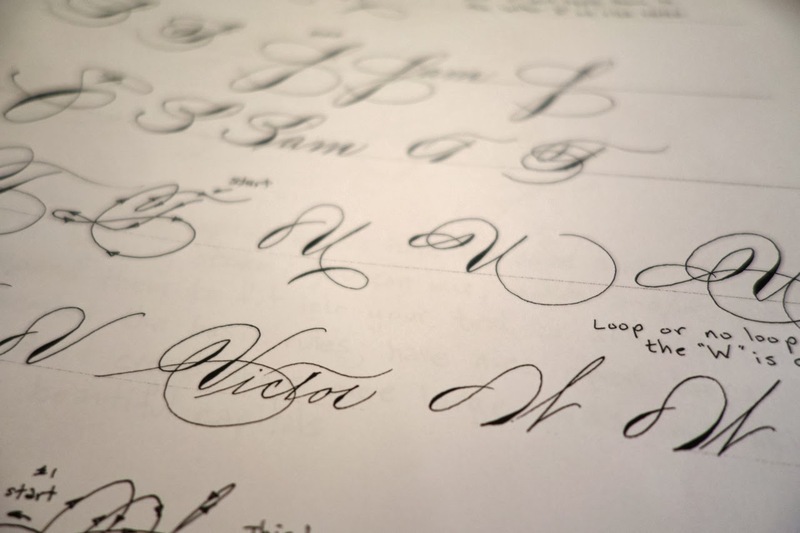 This spring, Bill will teach the Spencerian Intensive Weekend Series, a three-weekend workshop designed to help beginners and experienced calligraphers alike learn this beautiful script. 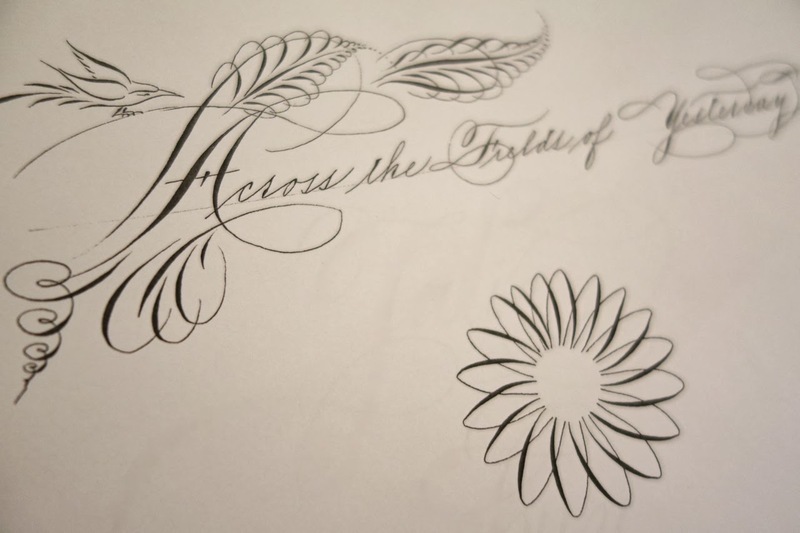 Here, he answers some questions about his career and the upcoming Spencerian Intensive. Do you remember your first exposure to calligraphy? I’ve always been interested in script, but I didn’t really know what calligraphy was until I was in my early to mid-twenties. My father drank Stroh’s beer, and the script on the bottles and cans caught my eye. I wanted to know how that was done. When I was in high school I took all the drafting courses available to me. I wanted to be an architect and was interested in letterform, but at that point in my life I didn’t have a clue about what calligraphy was—I don’t believe the word “calligraphy” was even in my vocabulary. What eventually led you to take it up? It’s hard to say what truly made me take up calligraphy. When I was in the military I was stationed in Albuquerque, New Mexico, where I worked in a laboratory. I got out after serving my four years and stayed in Albuquerque, eventually taking a job with the federal government in the same lab. In 1979 I saw an ad for a calligraphy class being offered at the University of New Mexico’s continuing education department. Not really knowing a lot about calligraphy, I signed up for the semester-long course. You could say the rest is history. Do you have a regular practice to keep your skills up? When I first started, I took a college-ruled notebook to work and practiced in it during my break. Then I would practice when I got home in the evenings. I still have that notebook today. These days I’m constantly doing something that is lettering-related. I work only three days a week now, and on my days off I can be found at my drafting table doing some form of lettering. What sorts of commissions do you receive? Any unique stories? I am asked to copy poems, letter certificates, and write wedding invitations and envelopes. I would say that my most unique story was when a man asked me to transcribe all of his love letters to his girlfriend, who I think later became his wife. Once I was finished with the transcription I made the letters into a book. It was a unique and challenging project. Another unique job was writing 150 leather wedding envelopes. Yes, leather. The challenges were to figure out how to write on it, with what ink, and how to make my guidelines for putting the script on the leather! What has been the most rewarding aspect of calligraphy for you? Seeing someone’s expression when I hand them a completed piece of artwork they commissioned, whether it was addressing envelopes or writing a poem. The look in their eyes and the smile on their face is sometimes worth more than the payment. As an artist, what does the concept of mastery mean to you? My mentor for Engrosser’s Script, more commonly known as Copperplate, is Mr. William Lilly. His knowledge and understanding of the script and other points of lettering is just amazing to me, and he is able to show and explain what is needed to achieve a particular stroke or letterform. He is a true master. To me, a master is someone who has a true understanding of their art form. A master is able to teach that art form with heart, compassion, and desire, and to pass the skill along to a new generation. 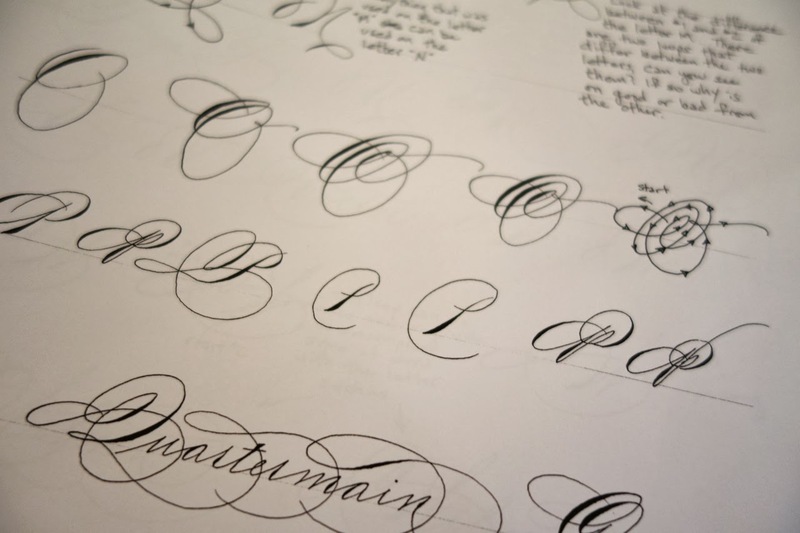 One of your upcoming classes is the Spencerian Intensive. What can students expect to learn in this three-weekend series? I am really looking forward to teaching this series of classes. Students can expect to receive a very thorough understanding of the letterforms. In my Introduction to Spencerian class we only get to spend about six hours on the lowercase letters, but in the Intensive course we will work with them for an entire weekend. This will give the students a stronger foundation they can build on to understand the script more thoroughly. During the second weekend we’ll study the capital letters, and the third weekend will focus on flourishes. Each student will work on a project of their own which incorporates these aspects, and the month between each weekend will give them plenty of time to practice. I make a new guidebook for each class I teach at Castle in the Air. Even in the classes I’ve taught again and again, I create new artwork and lettering for that class. The Spencerian Intensive book goes into more depth than any other guide I’ve created before. I’ve gone through everything I’ve ever taught about the script and have made a guidebook containing the entirety of what I can pass along to the students, who will be able to learn from it long after the course is over. The Spencerian Intensive Weekend Series with Bill Kemp is a rare opportunity for in-depth study with one of the world’s top calligraphers. To secure your seat in the class, visit the Castle in the Air Online Shoppe or call (510)204-9801. What a wonderful interview with my dear friend Bill Kemp. He is an amazing teacher and his students adore him. I know how hard he works on his instruction books. The Intensive workshop will be a wonderful experience for those lucky enough to attend.